After World War II and especially after the death of dictator Francisco Franco in 1975, Spain modernized quickly on economic grounds. However, in the last few years the government had to implement several austerity measures. A large budget deficit had to be reduced, but as a result Spain now has one of Europe’s highest unemployment rates. It’s estimated that more than 47.4 million people live in Spain, which makes it the 9th biggest country in the world. Slightly more than 46% of all Spanish people is between 25 and 54 years old. According to data from 2011 more than 28 million Spanish inhabitants have access to the internet. Every year there are several ecommerce events being organized in Spain. We have a handy ecommerce events calendar, where you can find all the major online retail events in Europe. But you can also check out only the ecommerce events in Spain. There are about 23.6 million ecommerce users in Spain, with an additional 5.6 million users to be shopping online by 2021. Credit cards amount for more than half of all online transactions, followed by cash (32%), electronic bank transfer (20%) and eWallet (14%). The most important payment option in Spain seems to be 4B, which has 20 million cards circulating amongst the Spanish population. The credit and debit cards of Euro6000 are also widely used. Based on information from Observatorio Cetelem Ecommerce 2016, the most popular payment methods in Spain are debit card (used by 61 percent), PayPal (51%) and credit card (23%). 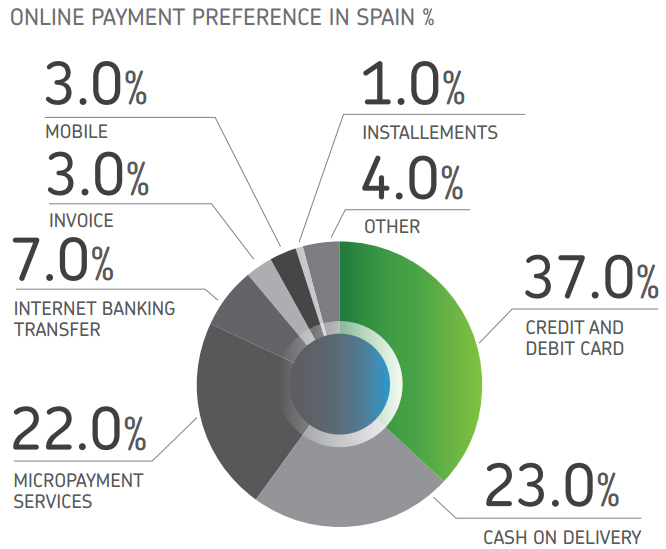 Online payment methods in Spain, according to Payvision. According to data from IAB Spain, 44% of Spanish Internet users between 16 and 55 years old recurrently buy online. Last year their purchases could mostly be divided into the next product categories: fashion (65%), travel tickets (59%), consumer electronics (55%), tickets (54%) and books & CDs (46%). Data from the National Observatory for Telecommunications shows that about 18.6 million Spaniards bought something online in 2014. Based on data from from Instituo Nacional de Estadictica, about 22% of the Spanish population bought something in the last three months prior to a survey in 2012. About 10.7 million Spanish people (31% of the population aged 16 to 74 years old) ordered something online in the last year. Spain had to deal with a big financial crisis, but that was barely visible in the ecommerce sector. In fact, the ecommerce industry was one of the few sectors that experienced a double digit-growth in 2011 and 2012. The total ecommerce turnover accounted 11 billion euros in 2011, which was 22% more than the year before. Nonetheless, ecommerce sales only accounted for 1.2% of Spains gross domestic product that year. Ecommerce in Spain was worth 16.26 billion euros in 2014, data from the National Observatory for Telecommunication shows. A lot of Spanish shoppers order their stuff on foreign websites. Last year it was for the first time in history the total amount of purchases made on foreign online shops were lower than the ones on local sites. In terms of percentages ecommerce isn’t that big in Spain. It accounts for only 3% of total retail sales. More information about the ecommerce market in Spain can be found on EcommerceWiki. Popular online stores in Spain are El Corte Inglés, eBay, Amazon, Mil Anunacios, Segunda Mano, Lets Bonus, Groupon, Bing, eBay and Groupalia. March 28, 2019Correos, the national postal service of Spain, is teaming up with ecommerce giant AliExpress and Alibaba’s logistics data platform operator Cainiao Network. The companies want to better support small and medium-sized enterprises in Spain to grow into new markets, such as China. January 30, 2019ReBuy, an online platform for buying and selling refurbished consumer electronics, has expanded in Europe. The company has launched its online store in both Italy and Spain. The company already runs its online platform in German, the United Kingdom, France, Austria and the Netherlands. January 10, 2019Correos, the national postal service of Spain, has distributed more than 106 million packages in 2018. This represents an increase of 61 percent compared to the total amount of packages it managed during the year before. October 5, 2018Spanish pharmacy network Promofarma wants to deliver products to customers a lot faster than it currently does and is thus testing one-hour delivery. The new service will initially start only in Spain, but expanding to other countries in Europe is something they are thinking about. Read all our articles about ecommerce in Spain.